Thermogroup UK is a family owned organisation with a passion for continuous improvement. We are incredibly fortunate to have such a dedicated team of highly motivated personnel, who share our ethos and work hard to help us deliver that little bit extra and exceed our customers’ expectations every day. Thermonet electric underfloor heating products are manufactured in our dedicated manufacturing facility in Germany giving us intimate control over quality assurance, flexibility, product development and the ability to provide special products and OEM packages. 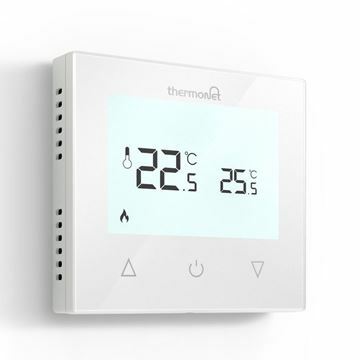 The new Thermotouch 9.2mG Glass Thermostat features a sleek white glass display and simple, manual underfloor heating controls. 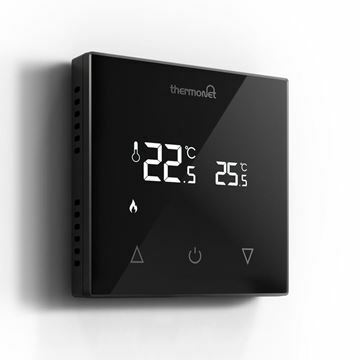 The new Thermotouch 9.2mG Glass Thermostat features a sleek black glass display and simple, manual underfloor heating controls. Thermotouch 5220 Programmable Glass. Choose either Piano Black or Ice White Glass finishes to compliment your interiors. The new Thermotouch 5226 Programmable Glass Thermostat. Choose either Piano Black or Ice White Glass finishes to compliment your interiors. The original, patented underfloor heating and uncoupling membrane solution.